WASHINGTON, DC -- In a first concrete achievement from the nuclear security summit meeting here, the government of Ukraine said on Monday that it would eliminate its stockpile of highly enriched uranium. President Barack Obama meets with Ukraine President Viktor Yanukovych during the Nuclear Security Summit in Washington, Monday, April 12, 2010. Moments later, President Obama met with his Chinese counterpart, Hu Jintao, to try to build support for sanctions against Iran over its nuclear program. 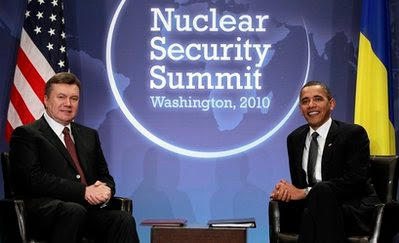 Mr. Obama could thus claim some progress toward his ultimate goal of securing global supplies of enriched uranium and plutonium, which leaders of the more than 40 countries assembled here fear could fall into terrorists’ hands. Ukraine agreed in 1994 to return the former Soviet nuclear warheads on its territory to Russia, but it retained stockpiles of enriched uranium, some of it extracted from those weapons and returned to Ukraine. On Monday the country vowed to eliminate its highly enriched stockpiles by 2012, the date of the next nuclear security summit, with “substantial” progress toward that goal promised for this year. Ukraine will instead use low-enriched uranium in its civilian nuclear research facilities. The announcement followed a meeting in Washington between Mr. Obama and President Viktor Yanukovych of Ukraine, held hours before the formal opening of the nuclear security conference at the Walter E. Washington Convention Center in the center of the city. That came shortly before President Obama, trying to put a tense period behind them, met with President Hu of China. In addition to the question of new sanctions against Iran, the two were expected to address China’s currency policy, a perennial source of friction between Beijing and Washington. China recently signaled that it would loosen its control of the value of the currency, the renminbi, easing a confrontation with the United States, which was threatening to formally cite China for manipulating the exchange rate. The administration told China that it would delay a report on the issue for now, clearing the way for Mr. Hu to visit Washington for Mr. Obama’s nuclear security summit. China has also agreed to begin negotiating the wording of a United Nations resolution that would impose additional sanctions on Iran for defying the international community on its nuclear ambitions. But administration officials cautioned that China’s agreement to start talking about the resolution did not imply that it would support robust sanctions against Tehran — a step it has historically resisted. Leaders of 47 countries converged on Washington for the nuclear summit on Monday, the largest such assemblage since Franklin D. Roosevelt organized a meeting in 1945 that created the United Nations. In the hours before the formal start of the event on Monday, Mr. Obama is holding one-on-one meetings with leaders from Jordan, Malaysia, Ukraine, and Armenia as well as China. But the spotlight was squarely on his meeting with Mr. Hu, which follows a turbulent period in Chinese-American relations, with China assailing American military aid for Taiwan and Mr. Obama’s decision to meet the Dalai Lama, the Tibetan spiritual leader. In a bilateral meeting on Sunday, meanwhile, Kazakhstan agreed to let the United States fly troops and weapons over its territory, a deal which opens a faster and more direct air route over the North Pole for American forces headed to Afghanistan. Right now, troops and materiel are typically flown from the United States to Ramstein Air Base in Germany, and then on a flight path south and east over the Arabian Gulf and then north to Afghanistan by way of Pakistan — avoiding a more direct route over Iran, because Iran does not allow American military overflights. The new route over the North Pole, Russia and Central Asia to Bagram Air Base, the military’s main air hub in Afghanistan, will allow troops to fly direct from the United States in a little more than 12 hours. The agreement was reached at a meeting between President Obama and President Nursultan Nazarbayev of Kazakhstan. Officials said that the formal deal is not yet complete, but that the Kazakh president’s agreement to the flights, which American military officials had long sought, was an important development in the war effort. “The devil is the details, but this is obviously a great positive moment,” said Capt. Kevin Aandahl, a spokesman for the United States Transportation Command, which oversees military transport logistics. On the matter of Iran’s nuclear programs, which are a recurrent topic in and around the summit on nuclear proliferation, the Chinese are said by American officials to be worried about becoming isolated in their resistance to sanctions on Iran. But they are not alone in opposing tougher measures: Brazil, Turkey, and Lebanon, which hold rotating seats in the Security Council, all currently oppose new sanctions. With Lebanon scheduled to lead the council in May, European diplomats said it was unlikely that the United States and other Western countries would be able to get a resolution adopted before June. And the strength of that resolution still hinges on China’s willingness to act against Iran, with which it has wide-ranging commercial and trade relationships. Even as Mr. Obama pushes for tighter nuclear security, President Dmitry Medvedev of Russia suggested in an interview broadcast on Monday that the recently concluded strategic arms agreement — vaunted by the Obama administration as a step toward a nuclear-free world — might be vulnerable if the United States moves too aggressively on its missile-defense plans. Mr. Medvedev, speaking in Russian, told ABC News that the preamble to the accord asserts an “interconnection between the strategic offensive arms and missile defense,” a reference to the planned American facilities in Poland and the Czech Republic that are meant to combat a possible Iranian missile attack. “So if those circumstances will change, then we would consider it as the reason to jeopardize the whole agreement,” Mr. Medvedev said, according to the ABC translation of an interview taped Friday. Still, treaties typically have withdrawal clauses, and the language in their preambles is not always considered legally binding. Further, Mr. Obama himself had said he was “absolutely confident” that the treaty would not block American missile-defense work. “Missile defense came up time and time again in the negotiations of the new Start treaty, so this is not a surprise,” said Sharon Squassoni, director of the Proliferation Prevention Program at the Center for Strategic and International Studies, in Washington. She suggested that Mr. Medvedev, in an interview taped in Moscow, might have been speaking partly for domestic consumption, seeking to assure Russians that their interests were well represented.